Manuals and materials to download. 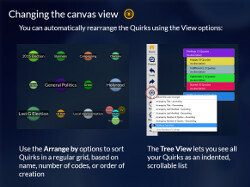 An overview of Quirkos, starting your first project, organising codes and making reports. Download example teaching slides, with a visual feature-by-feature explanation. Fictional interviews with 4 respondents, forming an example project for learning Quirkos, or any qualitative analysis software. You can download the raw sources in a variety of formats, or see coded Quirkos project files, and example outputs including reports. In 2014 we conducted semi-structured qualitative interviews with 12 respondetns about their thoughts on the Referendum for Scottish Independence. All the interview transcripts can be downloaded, and used as an example project to learn Quirkos. 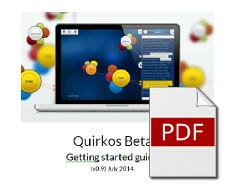 There are also coded project files, and a report created using Quirkos for analysis. Watch recordings of our recent on-line workshops.